28-week old layers from a flock in Turkey were tested in parallel with commercial Kit A and the ID Screen® MG test. While 11/21 (52%) samples were positive on Kit A, all animals were negative on the ID Screen® MG ELISA (Figure 1). When tested with the ID Screen MS® ELISA, however, this panel gave positive results for MS with very high titers (see Figure 2). Samples were also tested by RSA after de-complementation (56°C – 30 min): samples were positive with the MS antigen, and negative with the MG antigen (Figure 3). This study illustrates how cross-reactions may be obtained with competitors’ ELISAs. IDvet ELISAs show high exclusivity thanks to the use of recombinant protein antigens. In an experimental study performed by MSD, SPF layers were vaccinated with the Nobilis® MS live vaccine and tested with different MS ELISAs at 2, 3, 4 and 8 weeks post-vaccination (wpv). Commercial kit 1 detected only 10% of animals 2 wpv, with positivity reaching 70% at 8 wpv, indicating detection of IgG antibodies only. Commercial kit 2 detected 90% of animals as of 2 wpv, with the rate decreasing to only 20% at 8 weeks post-vaccination, indicating detection of IgM antibodies only. The ID Screen® MS kit detected more than 85% of animals as of 2 wpv, and this rate remained stable over time. The positivity rate was 70% at 8 wpv, indicating detection of both IgG and IgM antibodies. In a GD Deventer proficiency testing scheme for mycoplasma, the IDvet MS ELISA detected seroconversion as of 7 days post-infection, whereas Kit A gave negative results. The IDvet MG test is the only test which detected the 6/85 strain as of 4 wpv in the GD Deventer Proficiency Testing Scheme; the two other ELISAs gave negative results (Table 2). Chicken flocks were vaccinated only once at the age of 5 weeks with either the ts-11 vaccine by eye-drop or the 6/85 vaccine by spray. The 6/85 and ts-11 strains were kindly provided by the University of Melbourne, Australia. Samples were tested in parallel at 4 and 30 or 36 wpv using the ID Screen® ELISA, another commercial ELISA (Kit D) and a commercial MG RSA antigen (Table 3). 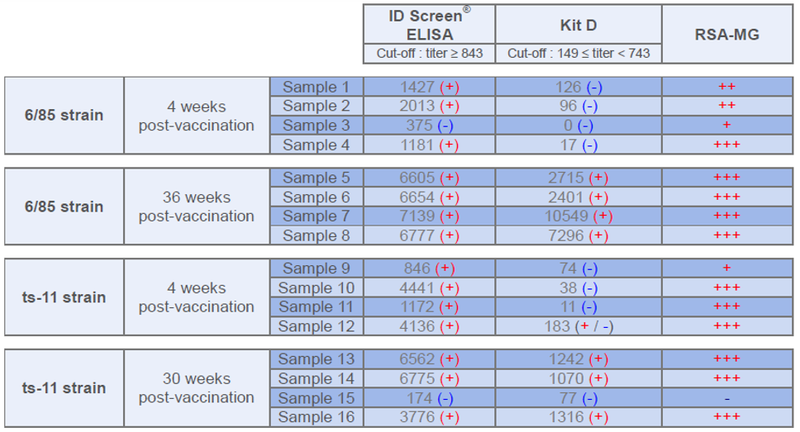 The ID Screen® ELISA detected animals vaccinated with the 6/85 strain even at 4 weeks post-vaccination, and showed good agreement with the RSA test. In conclusion, IDvet offers a complete range of ELISAs to monitor and control Mycoplasma in poultry flocks, offering reliable and accurate results.